When I started planning our little getaway a couple weeks back I turned to OpenTable in search of a restaurant for Saturday night. While spontaneous is nice we often get in a rut of what do you want, no what do you want and neither of us ends up satisfied. By finding a place in advance and making a reservation I knew we had one decision made so we could go about our Saturday adventures. I looked for a place with a mix of offerings and cuisines. To make a long story short we ended up dining at Black Trumpet Bistro. After breakfast we headed to Smuttynose Brewery. for a tour. Then we headed north to York, ME to visit Stonewall Kitchen. We had lunch in their cafe. So maybe this entry should be titled Eating York. We headed out around 9 a.m. in search of adventure, well coffee with a side of adventure. Ted found a highly recommended spot on Yelp named Popovers on the Square so we headed for Congress Street to check it out. I whisked my husband, Ted, away for a long weekend in Portsmouth (NH) this past weekend. In the next few posts I’ll share some of the places we ate, what impressed me, and what didn’t. When I came up with this menu the high for today was suppose to be 62°F. I think it might have reached 51 at most. Still, it was nice to use the grill again. I spent the day burning brush at my Mom’s house so Ted undertook the cooking duties again this week. Braised short ribs have become quite the rage with them appearing on restaurant menus and cooking shows a plenty. They can serve as a taco or steamed bun filling at some trending uber-chef place or sit atop a steaming pile of polenta at someplace less trendy. Trendy doesn’t necessarily mean fast though. Many short rib recipes call for a low and slow approach; several hours in a 300°F oven then a rest overnight followed by of skimming and reheating. Which is great if you have the time. I pulled some short ribs from the freezer Friday night because I knew I would have time today to cook them. Then time got away from me and I wanted a faster method. Enter the pressure cooker. Boon to time starved cooks around the world. 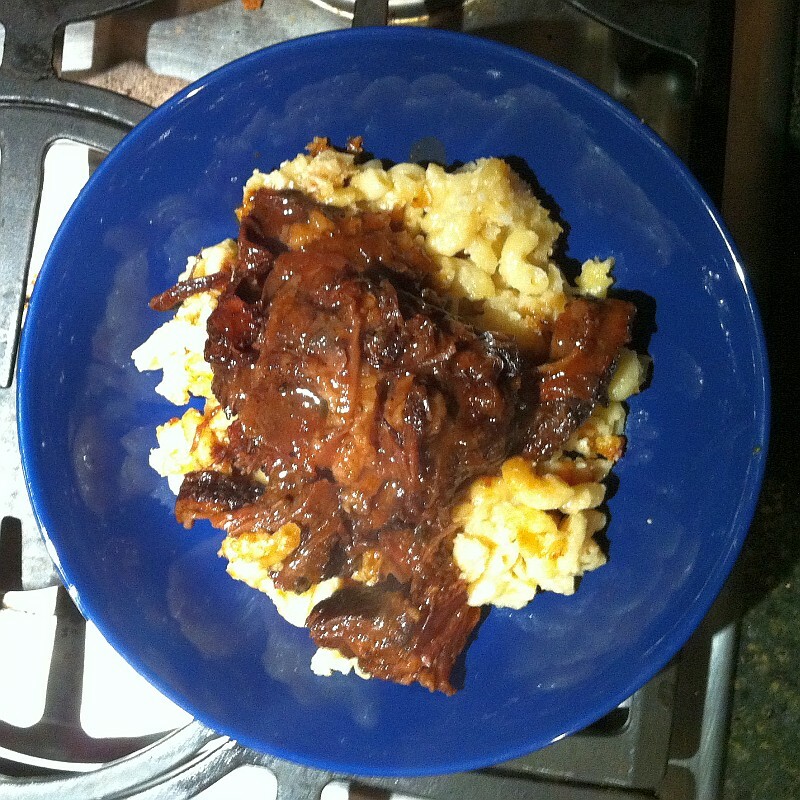 Here is the result, served over some reheated macaroni & cheese that my husband made last night.